This is the only toy that keeps all 3 of my kids occupied (ages 10, 6, 3). They have so much fun building and creating things together and then destroying it and building it again. The design and the quality of the boards is excellent. You'd be surprised what kids can create using their imagination with these pieces. Highly recommend! Our girls have so much fun with these and stay entertained for hours. It says 5 years and up on the box but our 4 year old can make her own designs and the 1.5 yr old loves to help with the blue connectors. Lightweight but surprisingly sturdy. I enjoy building with them too and more fun than couch forts. Would recommend. My grandson is asking for more fort boards so he can build larger structures. My granddaughters aged 5 and 2 love this kit. They have built the most amazing things with it. The 2 year old needs a little help connecting the blue connectors but she can connect the yellow boards with no problem. The 5 year old loves building with it. They are entertained for hours with this set. I've now ordered another set and I can't wait to see what they do with two sets. This is going to rival LEGO's. The package size is wonderful because everything fits right back in the box for easy storage. Very well planned. Our son (14) loves all things Nerf so he took his allowance money to help fund these boards on Kickstarter. The boards are solidly constructed and are a great addition to his arsenal and Nerf battlefield. Reasonably priced and EXCELLENT customer service. Thumbs up to these guys!!! We purchased a set in the pre sale since we know the maker. I bought them as part of our fun box for our friends's kids. Our friends' 2.5 yr old loved them when his dad built him fun creations to play in. He loved it so much that for the next several visits he didn't even say hi when he came in the door--just grabbed my hand and led me to the fort boards. I think his dad enjoyed them as much as the kid. We tried these at a Makers Fair and my kids were in love. I purchased a box for them and for their cousins. They've lead to endless creative ideas and I loved watching the older kids build stuff for the younger kids to play in. My oldest is 11 and the youngest cousin is 3 and they all were having a great time with this imaginative toy. Car, tug boat boat, castle, space station, storefront, igloo, spy hideout... Where will your child's imagination take them today? 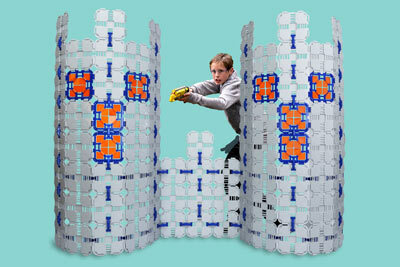 This creative toy let's kids build amazing forts and inspires parents to join in the fun. We have two sets and are considering a third to build a small village. I'm thinking we could look into city zoning and perhaps put a fort board cottage in the back yard and renting it out on VBRO. Worth a shot! I've purchased several sets of Fort Boards for kids of my friends & I have heard nothing but rave reviews. Kids love them & parents have fun building & creating right along side their children. Great gift & I'll be buying more. The boards are very intuitive. Once the kids realize how they snap together, their imaginations take off and they build amazing structures. These fort boards are great! My grandkids have built some amazing structures already. They're super sturdy and fasten together easily. The kids are 7 & 10 but younger kids would be able to use them also. They may seem a little pricey but they're built to last.